They will not believe their eyes when this stunning edible bouquet arrives at their door! Delicious and ready-to-eat pieces of Pineapples, Melons, Strawberries, Grapes, and Oranges have been masterfully carved and arranged to imitate a colorful bouquet of flowers, and then they've been covered generously in a layer of decadent Belgian Chocolate. But this bouquet will never have a chance to wilt. So beautiful, they won't want to eat it at first, but so delicious, they won't be able to resist! 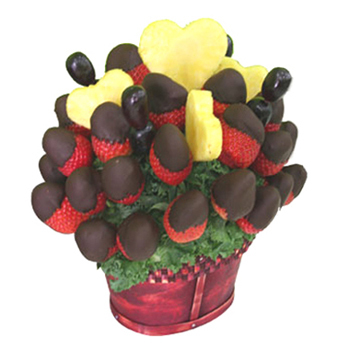 Send the Berries Deluxe Edible Bouquet to anyone on your list for almost any occasion: it makes a great gift for clients and business associates, a sweet gift for romantic occasions, and even an impressive way to say Thank You or Congratulations to friends.